A good rule of thumb for dental emergencies is to contact your dentist first. Heading to a hospital emergency room could waste precious time, especially if your tooth is knocked out because ER’s are not equipped to handle dental emergencies and they will likely send you to your dentist anyway. A broken tooth: For a tooth that is chipped or cracked, gather as many pieces as you can and get to your dentist. They will assess the best course of action at this point. 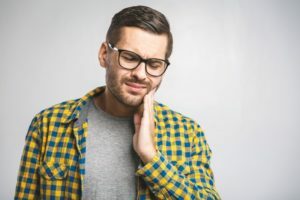 Dental pain or a toothache: Constant or severe pain in your tooth could be indicating an infection. Root canal therapy may be needed to preserve your tooth and eliminate the infection. A knocked out tooth: The window of opportunity to save a knocked out tooth is short, so don’t waste any time getting to your dentist. Place the tooth back in its socket or use milk to transport it safely. A lost or broken restoration: If you have a lost or broken an old dental crown or filling, your tooth may be sensitive. Even if it’s not, contact your dentist right away. Treatment is needed to protect your tooth from further damage. If you do lose a tooth or need to have one extracted, dental implants are an excellent solution for restoring your smile and your oral health. Because they replace both your tooth and your root, implants protect against the jawbone deterioration that occurs when your root is lost, and they also defend against shifting of your neighboring teeth. If you or a loved one is experiencing a dental emergency, we encourage you to contact your dentist right away. If you are anxious about visiting the dentist, sedation dentistry may be an option to help you get the treatment you need. Don’t live with pain or dental infection! Call your dentist right away to be seen. At Boyles General Dentistry & Implant Center, we are honored to combine the talents of three highly skilled dentists to bring you nearly 80 years of combined expertise. Comprehensive dental care and a friendly, comfortable environment are what our patients appreciate most about our Midland practice. If you would like to contact our team, we can be reached by calling 432-685-7011 or online.